Plant Based Recipe of the Week – Week 2 – Happy Birthday to me! Since becoming plant based, I’ve not tried many cake recipes (though I’m aiming to try my son’s recipe for brownies very soon!) so, instead of a birthday cake to celebrate my birthday, I went for my favourite dessert. A few months ago, I was gifted the Ms Cupcake book ‘The Naughtiest Vegan Cakes in Town’ and went straight to the lemon curd slice recipe. I love a lemon dessert! Usually when cooking or baking something new, I stick to the exact recipe for the first time but this one said 550g sugar and I just couldn’t do it. 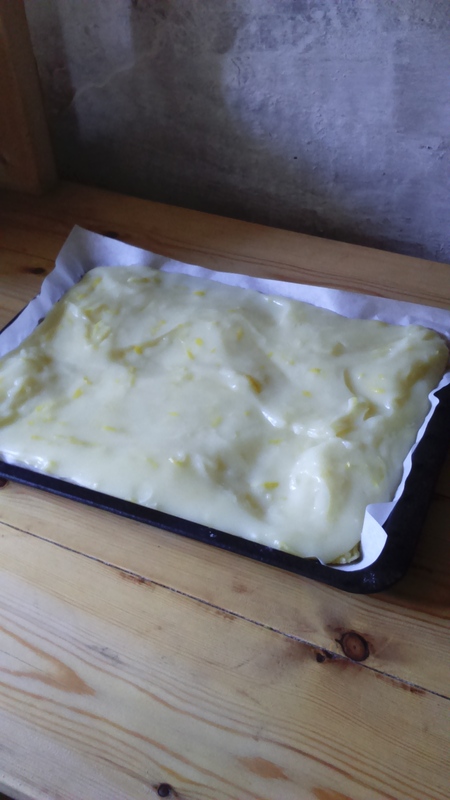 I’m listing her recipe here with my changes in brackets so you can taste for yourself as to how sharp or sweet you want your lemon curd slice to be. Preheat oven and line or grease tin. In a bowl, mix together the flour, icing sugar, fat and lemon zest. (Like making pastry crumbs) Press into prepared tin and bake for about 10 minutes until lightly brown. (If using dairy free marg, it won’t go very brown but 10 mins should do the job) Remove and allow to cool. Meanwhile, make the lemon curd. (Recipe says use a food processor or blender to blend lemon juice, water and caster sugar but I just stirred it in my large pan and it was fine) Put the cornflour into a separate, small bowl and add the lemon mixture to the cornflour a few tablespoons at a time, mixing together until you have a smooth thick paste with no lumps. Pour this paste back into the pan and stir to combine. Add salt and lemon zest. On a medium heat, bring the lemon and cornflour mixture to the boil, stirring constantly with a wooden spoon, takes about 5 minutes. As the mixture begins to boil, you’ll see it tuning a darker shade of yellow and become thick and glossy. Allow the curd to boil for about a minute, remove from heat. Add the soya cream and marg and mix together. Let the mixture sit for 3-4 minutes and then pour over the curd evenly on top of the cake in the tin. 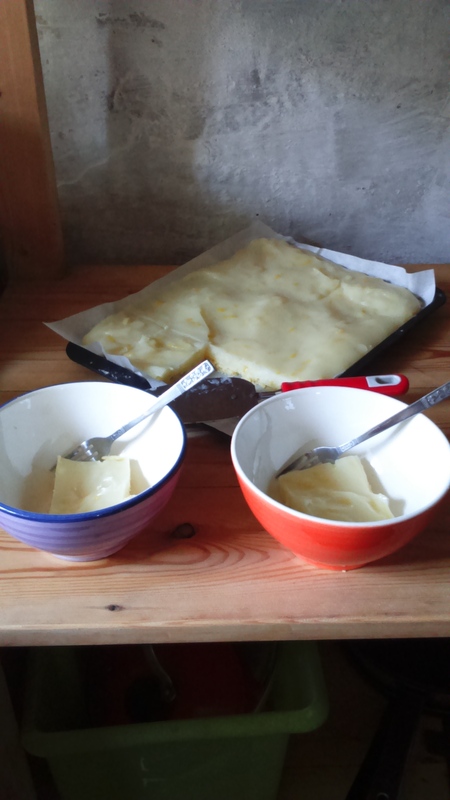 Allow to sit at room temperatue for at least 30 minutes before placing in the fridge in its tin for at least 2 hours or until the curd has firmed up to a cut-able consistency. Cut into squares and serve sprinkled with icing sugar if you wish. Store covered in fridge for up to a week. I’m sharing more of the birthday love so you can download my first Witchlit novel ‘The Naked Witch’, until 5th December for just 99p/99c and if you enjoy it, you can pay back the birthday love with a few lines of review to help others find my books.